Ikki began life as an arcade game about a group of peasants being led by one particular farmer in an uprising against the feudal lords of Japan. You control the lead farmer as you battle for control over your farm and home against the clans of ninjas that the lords have employed to quell the insurgency. Your primary weapon against the ninjas is a sickle. 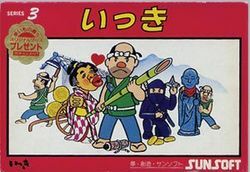 The game was converted for play on the Famicom, where you can collect various weapon upgrades, such as the ability to throw gold coins at the ninjas. The stage clearing goal differs slightly between the Famicom and arcade editions. In 2001, a reproduction of the Famicom game was packaged along with Super Arabian in Memorial Series: Sunsoft Vol. 1 for the PlayStation. This page was last edited on 29 March 2010, at 04:59.